Friedrich was the son of a candle manufacturer and was born in the small village of Greifswald on the shores of the Baltic. He received his first lessons in art from a drawings master in his native city. In 1794 Friedrich moved to Copenhagen to continue his studies at the Fine Arts Academy. The influence of the work of Danish painters such as Jens Juel and Nicolai Abraham Abilgaard can be appreciated throughout his oeuvre. After four years of apprenticeship and a brief period in Berlin, Friedrich settled in Dresden where he enrolled at the Academy. In 1799 he exhibited his work there for the first time and from then on regularly presented his paintings at the Academy until 1838. In 1808 he painted his celebrated Cross in the Mountains as the altarpiece for the church of Tetschen (Gemäldegalerie, Dresden). Friedrich’s work provoked violent criticism and generated a polemical debate as his use of landscape as the main motif of a devotional work was considered inappropriate. In addition, Cross in the Mountains is one of Friedrich’s first oils as he had previously focused largely on drawing. In 1810 the Prussian royal house acquired two of his paintings, Monk on the Seashore and Abbot in the Oak Forest (both Nationalgalerie, Berlin). On 12 November of that year the artist was elected a member of the Berlin Academy, followed by the Dresden Academy six years later. During this period Friedrich travelled ceaselessly, looking for first-hand contact with nature and returning to his native region on numerous occasions. During these trips he made numerous drawings and sketches from life in his notebooks, which provided the bases for his paintings. 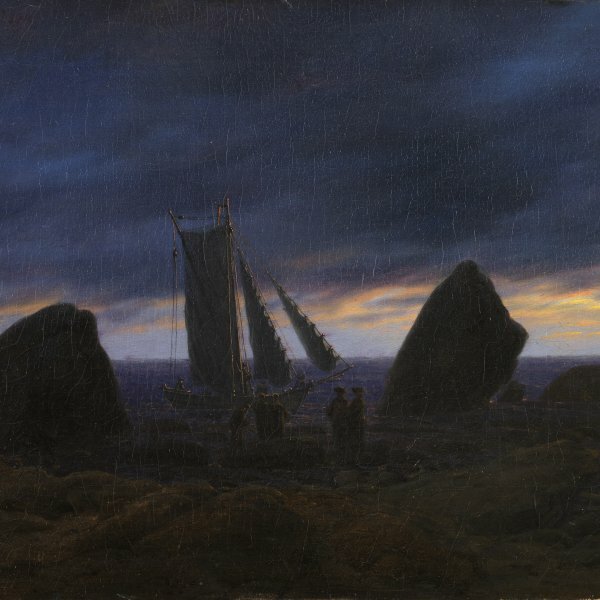 Around 1818 Friedrich painted The Sailing Boat (Hermitage, St. Petersburg), followed by Two Men looking at the Moon, 1819 (Gemäldegalerie, Dresden), and Moon rising over the Sea of 1822 (Nationalgalerie, Berlin). This period saw a change in the artist’s style as his compositions became less symmetrical and he placed a new emphasis on the figures, generally depicted in pairs. In 1835 Friedrich had an attack of apoplexy that obliged him to abandon painting although he continued to produce sepia drawings and watercolours. One of his masterpieces, The Ages of Man (Leipzig), dates from just before his illness. Friedrich died on 7 May 1840 and was buried in the Trinitatis cemetery in Dresden.